When I first came across Charles Labelle’s ongoing Buildings Entered project, I was intrigued by the questions it raised about how we relate to the spaces we inhabit. This led me to think about one of the things that has most fascinated me since moving in Hong Kong in 2008: the informal use of urban space, or to put it another way, how people adapt the city to their own ends. In the years following World War II and the Chinese civil war, hundreds of thousands of people moved from mainland China to Hong Kong, which was then a British colony. A decade after the war, Hong Kong’s population had doubled to more than three million. There wasn’t enough housing for the newcomers, so many built homes for themselves in shantytowns that rose on the hills above Kowloon and Hong Kong Island. At the same time, migrants made work for themselves by selling things on the street: cheap food for factory workers, fruits and vegetables, surplus stock from factories. This continued for nearly three decades after the war. 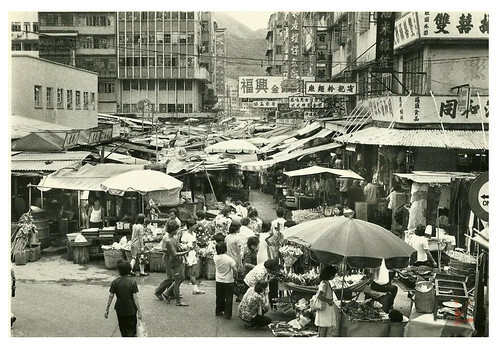 By the 1970s, there were more than 50,000 hawkers in the streets. All of this existed outside the framework of the law: shantytowns were built illegally on government-owned land and most hawkers operated without permits and without paying rent. The theory at the time was that, as cities transitioned from “third world” to “first world,” this kind of informal use of urban space would dwindle away as the economy developed and people became wealthier. Hawkers were an extension of the industrial economy, existing primarily to provide low-cost food and goods to the working class, who could take advantage of the savings this provided to accumulate capital and work their way up the socio-economic ladder. In light of this argument, the Hong Kong government opted for a policy of elimination through attrition. Squatter housing was gradually demolished and its inhabitants rehoused in utilitarian public housing estates. Street hawkers were licenced and regulated, but with the important caveat that licences were exceptionally hard to transfer, meaning that hawker stalls would eventually disappear after their owners died. The policy achieved its immediate goal: there are now just 7,500 licenced hawkers. Another 3,000 work illegally. Where the government’s policy failed was in assuming that the need for hawkers and cheap housing would eventually abate. Hong Kong’s transition to a service economy, the continued influx of poor migrants and competition from mainland China have undermined the social mobility that characterised Hong Kong in the 1970s and 80s. Since 1995, the percentage of Hong Kong people living in poverty has grown from 14.8 percent to 18 percent. Hong Kong is a city in extremis. It’s very densely populated, which means there are many competing demands for a very limited amount of space. The government’s response is to exert increasingly tight control over how that space is used. There is a constant tension between public behaviour and the restrictions to which it is subjected. In many ways, this defines Hong Kong’s urban form. This isn’t a city of architecture, it’s a city of building typologies: buildings created in response to regulations and market demands, which are then shaped by their inhabitants according to need. It’s like a banyan tree growing out of a stone wall, its roots eventually subsuming its inorganic surroundings. You can see examples of this all over the city, where apartment buildings sprout illegal additions meant to expand living space. 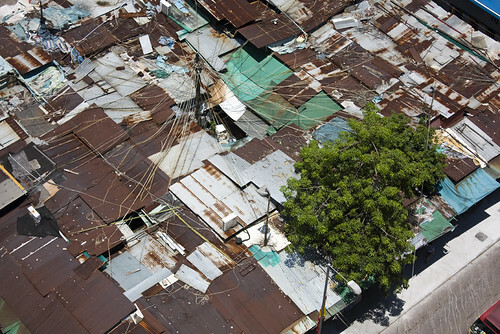 Illegally-built houses are especially common on rooftops, where they cluster together to form villages that resemble the shantytowns once found on Hong Kong’s hillsides. With a three-year waiting list for public housing, demand for these rooftop shacks is as high as ever. The same appropriation of space occurs at street level. Public space in Hong Kong is inflexibly designed, with fences and walls that restrict movement and street furniture that is often uncomfortable and unattractive. People respond by putting their own furniture in the street to create outdoor living rooms. On a hill near Mongkok, people have made benches using concrete and kitchen tiles, bamboo railings to help themselves up steep slopes and exercise equipment that hangs from the branches of trees. Chinese altars are built in the woods with styrofoam boxes and discarded pieces of cardboard. 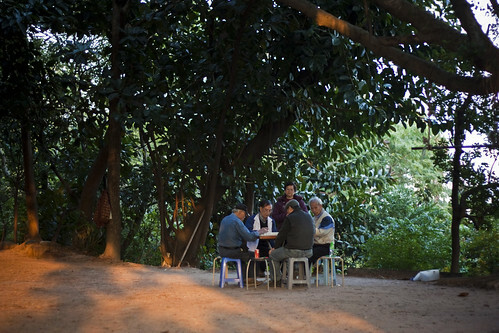 The sound of Cantonese opera and the clatter of mahjong tiles float through the woods. There’s a sharp contrast between these informal spaces and the hierarchies imposed by centralised development. You can see this in the government’s urban renewal projects, which replace street markets and small-scale housing with shopping malls and high-rises linked by above-ground walkways. It becomes particularly clear in the steep “ladder street” staircases of Central and Sheung Wan. The elderly have typically responded to these slopes by trimming the legs of household chairs and placing them at intervals on the steps, so that they can rest while climbing uphill. The formal response is to build escalators, which facilitate movement uphill and — not coincidentally — boost the property prices and development potential of hillside streets. If it is true that the grid of “discipline” is everywhere becoming clearer and more extensive, it is all the more urgent to discover how an entire society resists being reduced to it, what popular procedures (…) manipulate the mechanisms of discipline and conform to them only in order to evade them. Five years after Discipline and Punish, Certeau published The Practice of Everyday Life. In one of the chapters, he describes standing on the top of the World Trade Center in New York, 1,300 feet above ground. From there, he looked down at the city and found it easy to read. But this was an illusion, because he inevitably descended back to the streets, where things are chaotic and unclear. “The city is left prey to contradictory movements that counterbalance and combine themselves outside the reach of panoptic power,” wrote Certeau. He compared the way we live in the city to writing a text without being able to read it. How does this manifest itself in Hong Kong? Urban designer Michael Siu calls it “guerilla wars in everyday public spaces.” I think it’s an apt metaphor. Every winter, merchants in the Mongkok flower market gear up for Chinese New Year by loading up on orchids, orange trees and other traditional New Year plants. 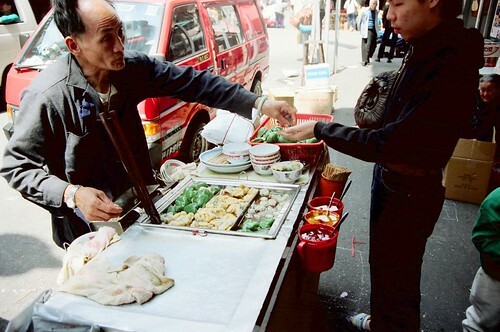 The market is patrolled by so-called Hawker Control Officers who unofficially allow the merchants to use a small amount of public space to display their extra wares; if the officers decide that goods obstruct public passage, they can impose hefty fines on the merchants. Every year, there are arguments between officers and the merchants, who argue that their allotment of public space is arbitrary and its enforcement unfair. This kind of conflict can be seen on an even larger scale in Tin Shui Wai, a master-planned New Town built in the 1980s. In order to build the town, the Hong Kong government had to buy land from Cheung Kong Holdings, the city’s biggest property developer, which insisted on a secret deal — exposed only in 2010 — that gave it a virtual monopoly on retail spaces in the town. As a result, food prices in Tin Shui Wai are some of the highest in Hong Kong, even though its inhabitants earn less than any other district in the city. For many, the only affordable option to shop at the early-morning “dawn market,” a gathering of illegal hawkers. Crackdowns on the market by Hawker Control Officers have sometimes been deadly; in 2008, a hawker was running away from the officers when he fell into a nearby river and drowned. Similar illegal markets exist in poor neighbourhoods all over Hong Kong — the roots of public needs and desires wrapping themselves around the hard surface of urban space. Illegal late-night flea market in Sham Shui Po. This post was adapted from a talk organized by Saamlung and held at Old Heaven bookstore and café in Shenzhen. This entry was written by Christopher DeWolf , posted on Thursday May 10 2012at 09:05 am , filed under Architecture, Art and Design, Asia Pacific, History, Public Space, Society and Culture and tagged Development, Hong Kong, Informal Settlements, Informal Space, Redevelopment, Street Furniture, Street Markets, Streetlife, Urban Design, Urban Planning . Bookmark the permalink . Post a comment below or leave a trackback: Trackback URL.